The world of Hoth is covered in an unending blanket of ice, making it inhospitable to nearly any lifeform. Yet this natural hostility means that many pass by Hoth without closer examination, making it the perfect place for the Rebellion to hide from the Empire. 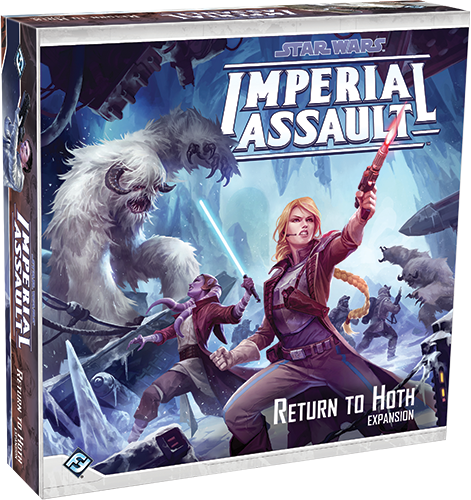 In Return to Hoth, an upcoming expansion for Imperial Assault, you can face the dangers of this icy planet yourself. 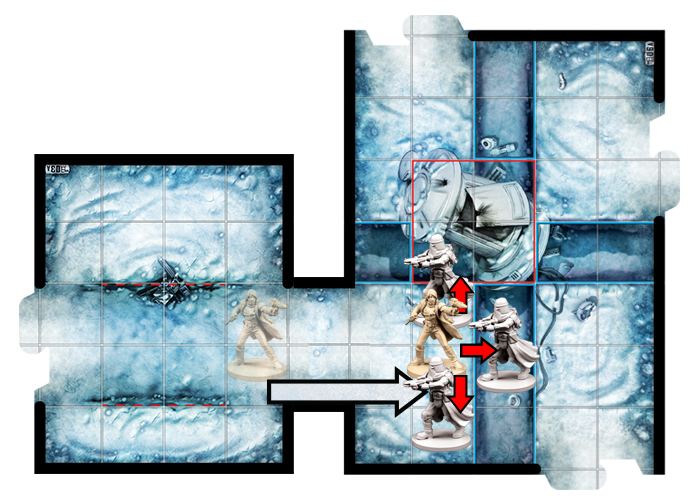 Return to Hoth is filled with new adventures in the Star Wars™ universe for your campaigns and skirmishes. With an entirely new full-length campaign, rules for multiplayer skirmishes, thirty-seven double-sided terrain tiles, and sixteen sculpted plastic figures, this expansion offers new missions and thrills in every game. 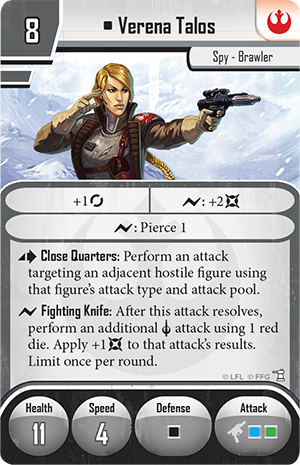 Today, we explore the new Rebel heroes that can join your team with Return to Hoth! 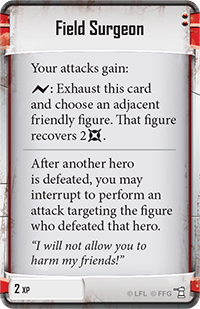 Most of the heroes in Imperial Assault are naturally focused on combat. Though they all approach battle in different ways, these heroes are ultimately concerned with dealing the maximum amount of damage to your enemies. In Return to Hoth, you have the chance to play a different kind of hero with MHD-19. 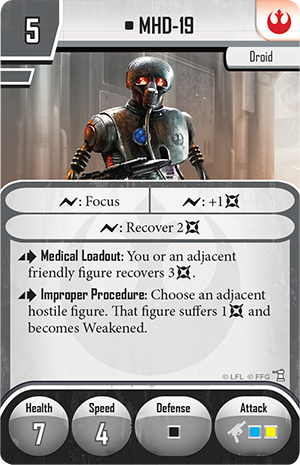 This medical droid can undoubtedly engage in combat alongside other heroes, but his true calling lies in tending other heroes’ wounds. 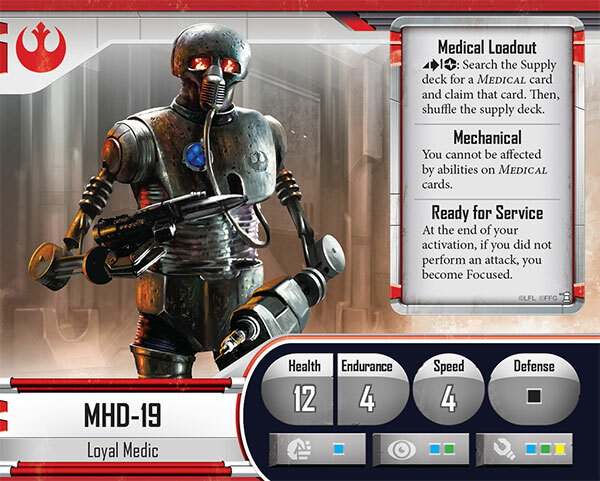 MHD-19’s Medical Loadout allows him to search the Supply deck for any Medical card by spending an action and suffering a strain—essentially giving you cards like Artificial Stimulants or Emergency Medpac exactly when you need them. 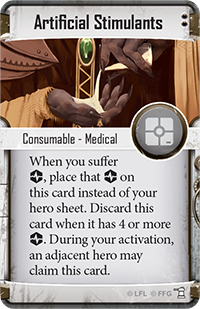 The flip side of this powerful ability, however, is that MHD-19 is a Mechanical being; Medical cards cannot affect him at all. Together, these two abilities lead you towards altruistically aiding your fellow heroes and playing the role of a competent combat medic. As you spend more time aiding your fellow heroes, you’ll make fewer attacks, but that just means you can make your attacks count when you do make them. MHD-19’s final ability is Ready for Service: at the end of your activation, if you didn’t attack, you can immediately become Focused, significantly increasing your power the next time you do attack. 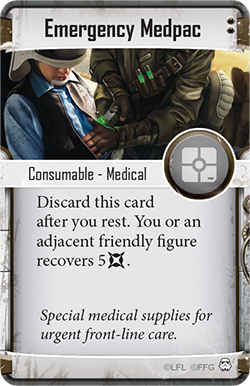 Like every hero in the campaign, MHD-19 also features a unique deck of Class cards that enhance his medical proficiency. Field Surgeon heals your friends even as you perform attacks, Miracle Worker can save a hero on the brink of death, and Bacta Radiator creates an aura of bacta in the air to effortlessly heal heroes at the start of every round. When equipped with his medical equipment, MHD-19 could become an indispensable part of any hero team. Joining MHD-19 in Return to Hoth is Loku Kanoloa, a deadly marksman and a member of the Mon Cala Special Forces. Although Loku lacks the health to go toe-to-toe with many Empire forces, he’s an expert in reconnaissance and striking from afar. 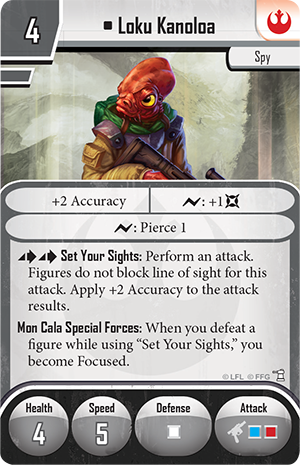 By suffering two strain at the beginning or end of your activation, you may use Loku Kanoloa’s Set Your Sights ability to place a recon token on any hostile figure in his line of sight. 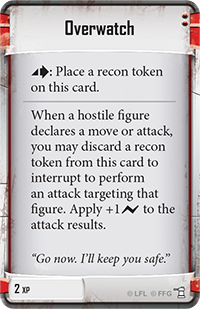 These recon tokens have no inherent benefits, but when you or a friendly figure attacks a figure with a recon token, Loku’s ability lets you apply an extra damage to the attack. More importantly, you don’t need to discard the recon token to gain this benefit, meaning that you can benefit from extra damage until the figure is destroyed. 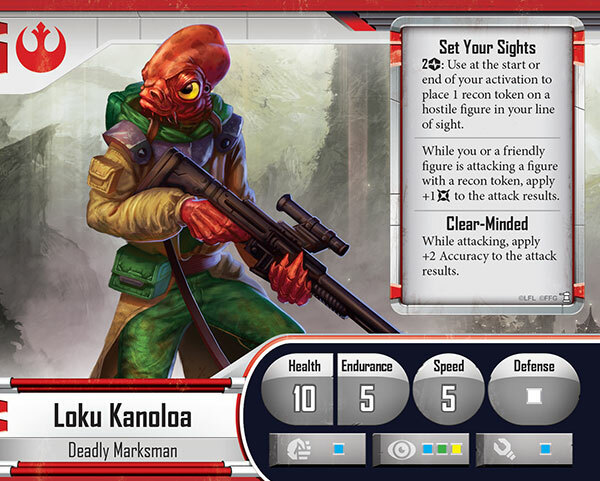 As Loku Kanoloa fires his shots from long range, you can also benefit from his Clear-Minded ability, which applies a constant accuracy boost to all of Loku’s attacks. Your recon tokens become much more dangerous with the aid of Loku Kanoloa’s unique Class deck. 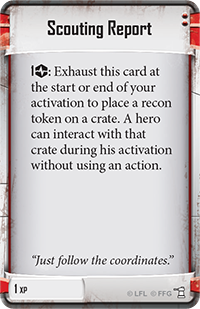 With Scouting Report , you can suffer a strain to place a recon token on any crate. Then, a hero can interact with that crate without spending an action, allowing you to collect supplies much more efficiently. You may use Overwatch to interrupt a hostile figure’s movement or attack with an attack of your own, perhaps cutting down Imperial soldiers before they intercept your heroes. 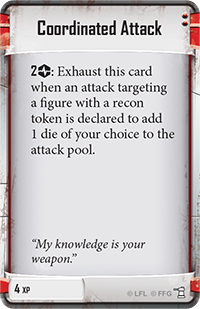 You may even use Coordinated Attack to add one die of your choice to any attack targeting an enemy with a recon token! 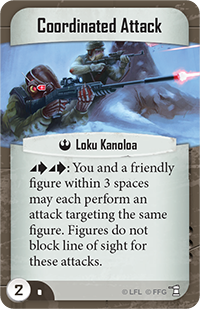 While Loku Kanoloa prefers to stay at a distance and cover the other heroes, the final hero introduced in Return to Hoth wants to be in the thick of the battle. Verena Talos is a Rebel operative, and she’s most dangerous when she’s right beside her foes. Verena Talos’s first ability is Close Quarters, which cements her ability to quickly dispatch an entire team of Stormtroopers or other Imperials. When an adjacent hostile figure is defeated, you can suffer two strain to immediately perform an attack using the defeated figure’s attack type and attack pool. What’s more, you can spend a surge during this attack to gain extra accuracy and damage! By rushing into a group of tightly massed figures, Verena has the potential to chain attacks together until she’s the only figure left standing. Naturally, being so close to enemy figures exposes Verena to a great deal of firepower. Fortunately, she can also take advantage of Duck and Weave—while Verena is defending, if she’s adjacent to a hostile figure other than the attacker, she automatically gains a bonus evade, helping her dodge many surge abilities. Verena Talos’s Class deck only increases her prowess in close combat. 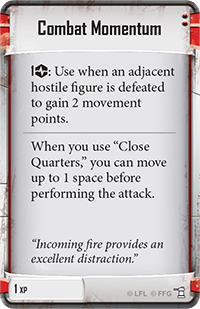 Combat Momentum lets you suffer a strain to gain movement points when an adjacent figure is defeated, and in addition, it lets you move a space before you perform your Close Quarters attack, bringing you into position for your next blow. 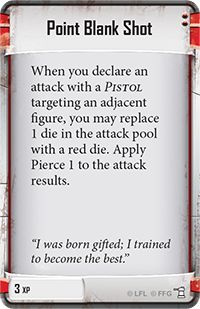 You can use Point Blank Shot when attacking an adjacent figure with a Pistol weapon to swap one of your attack dice for a red die and gain Pierce 1 for the attack. You might even, through extensive training, attain the level of Master Operative . 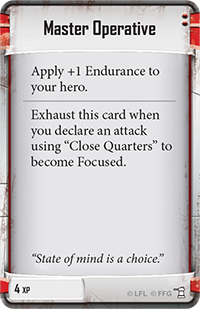 This Class card increases your endurance, potentially allowing you to trigger Close Quarters three times in a single activation, and you can exhaust Master Operative when you use Close Quarters to become Focused! 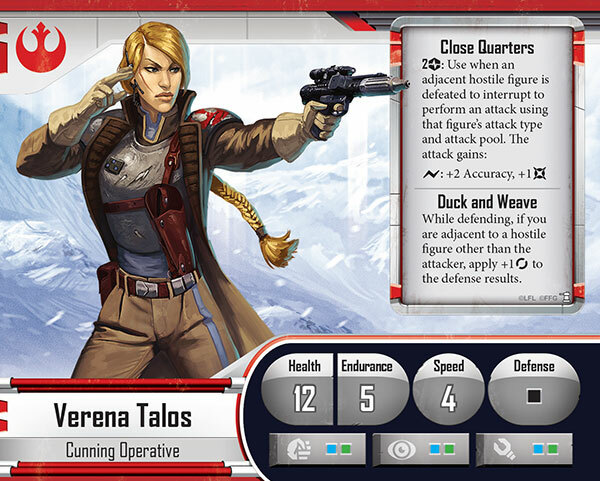 With the combination of the Close Quarters ability and the Master Operative Class card, Verena Talos can move forward and easily destroy a squad of Snowtroopers with a single attack action! Each of these Rebel heroes also enters the skirmish game with a unique Deployment card and Command card. 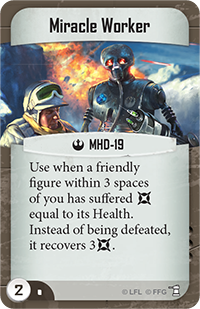 If your opponent is trying to win by destroying all of your figures, you can directly oppose his victory condition and buy yourself more time with the addition of MHD-19 to your strike team. MHD-19 can spend an action for himself or a friendly adjacent figure to recover three damage. Naturally, this healing power makes MHD-19 a target, but he also can spend a surge during an attack to recover two damage, making him surprisingly difficult to kill. 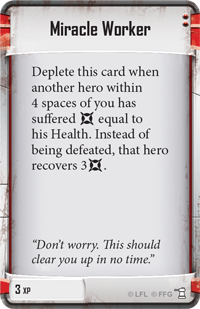 You can even use the Miracle Worker Command card to save a figure from imminent death! Much as in the campaign game, Loku Kanoloa is best suited to staying back and firing from the back of your group. Under most circumstances, this strategy wouldn’t be viable because figures would quickly block Loku’s line of sight, but he can spend two actions using Set Your Sights. This ability allows you to perform an attack, and during this attack, figures don’t block line of sight. With a bonus two accuracy added to the constant additional accuracy that Loku always receives, you can fire from long range and still make your attacks count. You can bring even another figure into your attack with the Coordinated Attack Command card. 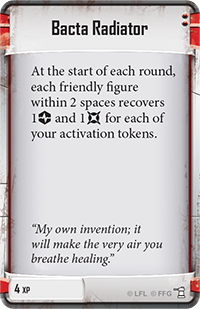 When you play this card, you and friendly figure within three spaces may each perform an attack targeting the same figure—and figures don’t block line of sight during these attacks! Moreover, when you defeat a figure using Set Your Sights, the Mon Cala Special Forces ability allows you to become Focused, making your next attack even more dangerous. Finally, you can summon Verena Talos to supplement your strike team with her unique brand of brawling skill. As an action, Verena can use her Close Quarters ability to perform an attack targeting any adjacent hostile figure using that figure’s attack type and attack pool. Suddenly turning the weapons of General Weiss or Darth Vader against themselves can make it much easier to destroy these monstrous threats, and by playing the Master Operative Command card when you use this ability, you’ll also become Focused and gain a bonus surge! Verena Talos can also spend a surge during an attack to trigger her Fighting Knife ability. After your first attack resolves, Fighting Knife allows you to perform an additional melee attack using a single red die, with a bonus damage thrown in for good measure. 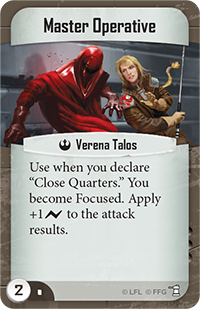 In your Imperial Assault skirmishes, even the most villainous servants of the Empire have good reason to fear Verena Talos’s skills. In the aftermath of the Battle of Hoth, the Rebellion lies scattered and weakened. 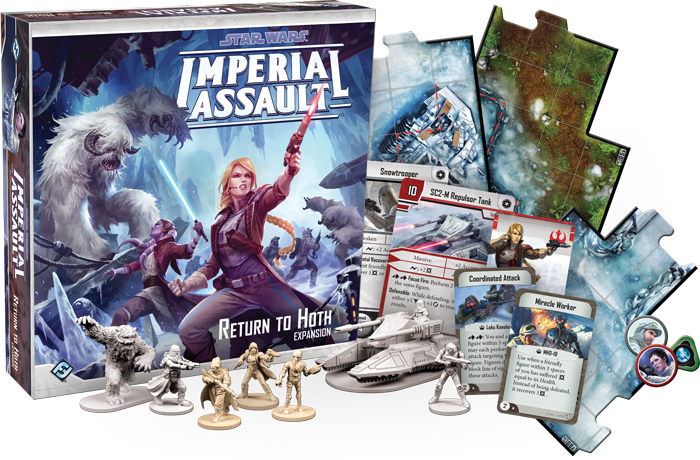 Yet with the Rebel heroes introduced in Return to Hoth, you can rally these disparate pieces and lead the Rebel Alliance to victory in a campaign or a skirmish! Pre-order your copy of Return to Hoth at your local retailer today, and join us next time for a preview of the General Sorin Villain Pack!